It's been a stellar year for drum gear. And a look back at the abundance of new products launched at 2008's NAMM Show and Musikmesse highlights the extent of technological advancement. Yamaha's DTXtreme III is a milestone in electronic kit making, DW's X Shell technology is a giant leap for drumming kind and Tama's new small, shallow-tom Superstar configuration will, almost certainly, be copied by every other manufacturer in 2009. 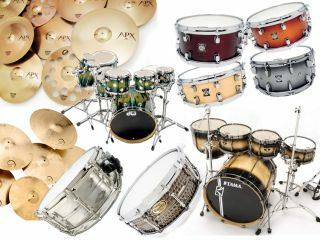 Small, shallow toms are nothing new, but ditching the wide boys in a 'bigger-is-better market' is a brave move from Tama. It's also one which pays off - sound wise - immeasurably. They're another example of how Chinese manufacturing has progressed: the finishing (of the bearing edges in particular) is excellent. Pearl's overhauled Vision line deserves a mention here, too. We caught a glimpse at NAMM but the next issue of Rhythm magazine (on sale 22 December) has the full glowing review. So what the hell is X Shell technology? That's a good question, and one answered exceedingly well in this review. Essentially, though, it revolves around the cross-laminating of the drum's ply. DW has found a way to lay them vertically instead of diagonally for a lower tone or, distinctly Bonhamesque-sounding drum. Does it justify the hype? More than so, hence the inclusion here. It's an inspired idea. It's been a bumper year for Dream with its Contact range and - our favourites - the Bliss collection making a lasting impression on the cymbal market. Manufactured in China but not mass produced, these versatile discs are full of character and can proudly stand up against any other brand. Judge with your ears and you'll be pleasantly surprised. Ok, so this year's cream of the metal snare crop was actually Craviotto's Diamond Series. Gorgeous drums which blew us away in every department. Unfortunately, they cost £1800 a pop so, unless you're Chad Smith (who funnily enough owns the first Craviotto Diamond ever made) they're unobtainable. Instead, try Worldmax's latest and massively-improved collection of snares: responsive, powerful and - above all - affordable. Highwood's Hammer models are a worthy runner-up, too. Hilarious 'dumb drummer' jokes aside, drum software has come a long way in recent years and Toontrack's Superior 2.0 is a shining example of a powerful yet easy to use package. The fact that - for the price of a low-end snare drum - you can enjoy the sound of a high-end, expertly tuned kit recorded in a great room using expensive studio equipment, almost makes us wonder why we bother with the real thing. Almost.